Last year when Tesla announced that they are launching the ‘key fob’ for Tesla Model 3, it got many many owners excited, but one of the features from the fob was missing ‘Summon’ — the ability to vertically move your car to and from tight parking spaces while standing outside the vehicle. Summon is a part of the ‘Autopilot/FSD‘ features of Tesla’s electric vehicles, previously, owners were able to summon their Model 3 using the Tesla mobile app, now the feature is enabled for the key fob. You can buy the Tesla Model 3 Key Fob from the Tesla online store for $150 but at the time of this writing, the device is ‘sold out’ again. 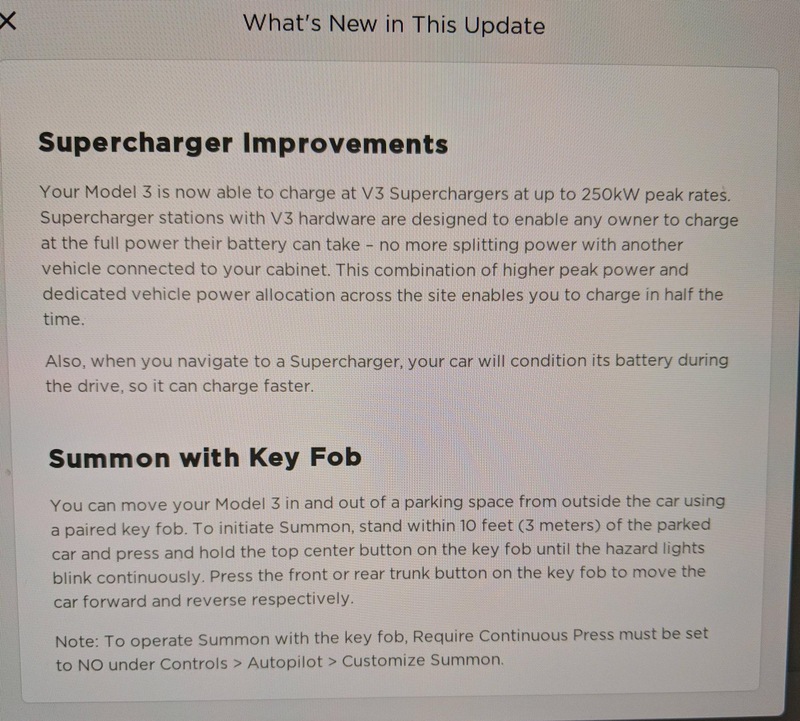 To use the summon feature on a newly purchased key fob, the device should first be paired with your Tesla Model 3 and some options be enabled (mentioned in the release notes below). You can move your Model 3 in and out of a parking space from outside the car using a paired key fob. To initiate Summon, stand within 10 feet (3 meters) of the parked car and press and hod the top center button on the key fob until the hazard lights blink continuously. Press the front or rear trunk button on the key fob to move the car forward and reverse respectively. Note: To operate Summon with key fob, 'Require Continous Press' must be set to NO under Controls > Autopilot > Customize Summon. The 2019.7.11 release notes screenshot (below) is shared by Erik (@teslainventory), this software update also includes V3 Supercharging capability for Tesla Model 3 vehicles which is in beta mode and currently only available to Tesla Early Access Program participants. Tesla is also working on ‘Advanced Summon‘, according to Elon Musk the car will follow you like a pet, Advanced Summon is expected to deploy to HW 2.5+ Tesla vehicles this year.